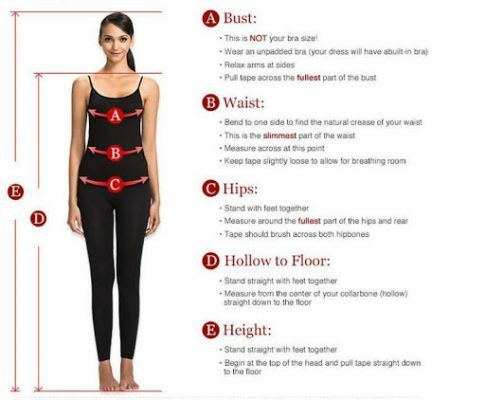 When purchasing your dress, it is important to take your MEASUREMENTS using the guide below rather than ordering your high-street size as prom dresses are not like normal high street sizes. We recommend when taking your measurements to not pull the tape in too much as to leave half a fingertip to allow for any size change. When sizing up your gown against the specific designer’s chart always go buy the largest measurement whether it be your bust waist or hips as dresses can always been taken it but it becomes harder to let them out! DRESS LENGTH – Dresses are made in one length so they are suitable for everyone to purchase, and a tailor will easily be able to shorten the length accordingly once you have you correct shoes. Therefore, please note that the ‘Hollow to Floor’ and ‘Height’ measurements are not necessary to consider when purchasing our dresses. 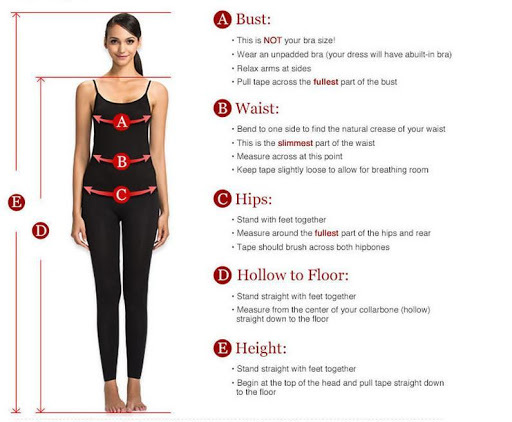 Please note these size charts are for reference only and should be used as a guide when taking measurements and dresses still can vary from these measurements therefore, we advise that you use your largest measurement to minimise the risk of the gown being too small.